I have a facetiously legal question for you all today. In a relationship, when you have a disagreement, should the wronged party be entitled to punitive damages? So, basically, meant to ensure that a person has learned their lesson, corrected their reprehensible conduct and will not let a similar action occur again. I think some of society’s relationship rituals are currently based on the idea of punitive damages. For example, yesterday Ducks sent me some flowers to celebrate our 2 1/2 year anniversary (we always celebrate half-years. And, no, this post is not completely meant to brag about how cute my husband is). However, it never fails, whenever he sends me flowers, someone always says something like, “Oooh, he must be in trouble,” or “Oh, what did he do?” As if the only reason that a husband or significant other would send flowers is because he committed a grievous act of some sort. Personally, I don’t even know that I’d want flowers for that reason. After all, they’re supposed to make you happy, and I think flowers sent because of a fight would just make me remember the fight, not the loving person behind the flower order. So, what do you think? Should the injured party/the person not-at-fault in the relationship be allowed to require some type of grand gesture to signify true repentance and a commitment to the relationship? I feel like I already act this way sometimes, because if we fight, I’ll try to be extra angelic, make his favorite meals, etc. But, officially, as you may can tell, I’m kind of on the fence about this, and am curious to hear your thoughts. ** DISCLAIMER on my husband’s behalf: He would like me to assure you all that we are not actually fighting or disagreeing and that this is not a passive-aggressive blog post to talk about my frustration with him. This entry was posted in Dilemmas, Domesticity, Wonderings and tagged flowers, love, pentitence, punitive damages, relationship questions, repentance, sweet husband gesture. Bookmark the permalink. But yes, I think we should have PD in day-to-day life 🙂 It’s a good way to move on and signal that there’s nothing deeper going on. Uh oh, whatever the story is from yesterday, I hope it’s all blown over! What an interesting question you pose… To me, and this is in theory and much easier said than done, isn’t forgiveness all about being the bigger person, accepting the mistake and apology and moving on? I don’t think it should necessarily involve having to always make up for it. We all make mistakes. That being said, I think often times we DO try to make up for it, and expect the other person to also. Myself included. So I don’t know the answer, but you’ve sure made me think! J gives flowers. 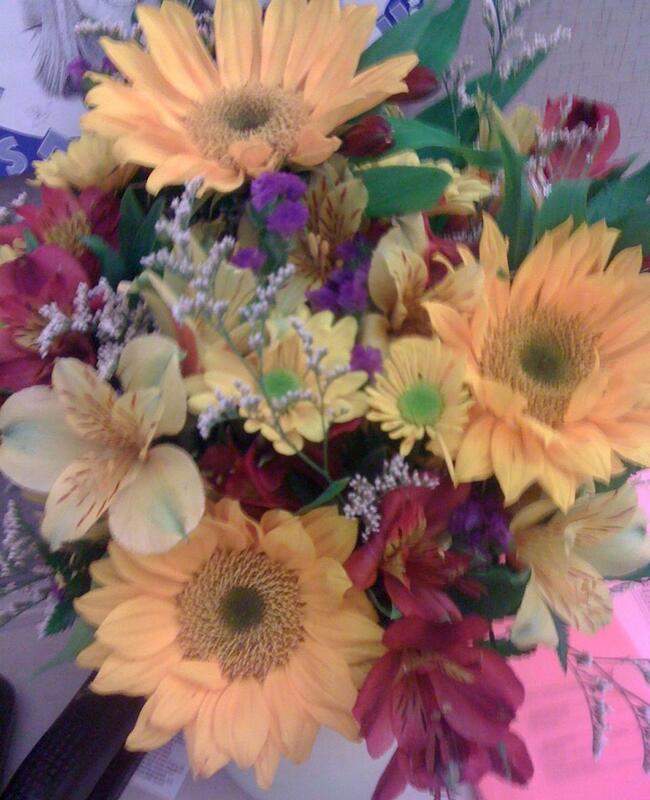 It’s nice to receive them, but I’m with you: I’d rather get them for happy occasions. I do happen to love the apology letter. Does that count as PD? I think emotions are sometimes better expressed in written words. Just a note saying that he understands why I’m upset and that he he’s sorry goes a long way! Hmmm…I hate to be all “my relationship is perfect,” but we’ve never really had a big fight. I mean, we bicker now and again and I’m a cranky pants, so I get grumpy sometimes, but we usually just leave each other alone for a few hours and the air clears on it’s own. But, I work in the legal field right now and usually on the defense side, so I’m going to say I don’t even like the phrase “punitive damages.” It sure does get thrown around a lot too. Sometimes PD are just used as a bullying technique, so I don’t think it actually “teaches” anyone anything. Your flowers are so pretty!! Congrats on 2 1/2 years! !